Elorus allows you to view time entries per project, task, client, user or a combination of the three. With this, you can see where-and for whom-most of your organization time is being spent. It can also assist with employee evaluation. 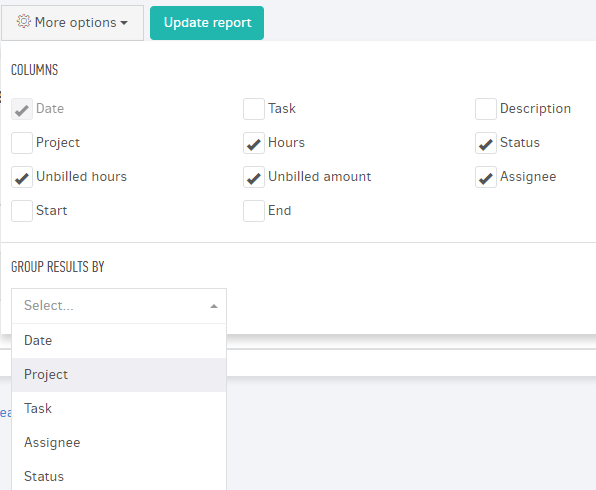 You may also use the report to view which user has logged the most time, which helps you evaluate the performance of each employee in each project/task and much more. This report collects all the time entries and according to the criteria you select, can be grouped accordingly (per project / task / user, etc.). In order to view time entries reports, go to Reports -> Time entries detail. From the Period button, you select the interval for which time entries will be displayed, and in Filters you select the desired ones, for more targeted results. From the More options button, you specify the columns that the table will contain and how the records will be grouped. 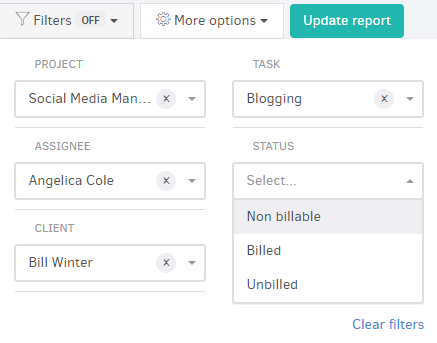 Clicking Update report, Elorus will create a list of subtotals for each grouping and at the bottom totals for time entries and billed on unbilled amounts.